After a year of political upset, which came to characterise 2016, we are finally in the midst of recovery. In fact, the past year has seen greater stability among economies and financial markets. According to the Brookings-FT Tiger index, a set of tracking indexes for the global economy, growth has seen a sharp uptick both in advanced and emerging economies in 2017. For the latter, growth has reached levels not seen since 2013. Against this increasingly favourable backdrop, one standout player in the finance sector continues to excel: Islamic finance. The sector has expanded rapidly over the past decade, in line with demand for Sharia-compliant services and products. Between 2000 and 2016, Islamic banks’ capital grew from $200bn to an incredible $3trn, with this figure expected to reach $4trn by the early 2020s. Now expanding by an annual rate of 19.7 percent, growth in the Islamic finance sector far outpaces that of conventional banks, putting pressure on traditional financial institutions to diversity into Sharia-compliant services. With a surge of interest among consumers from non-Muslim majority countries, the Islamic banking market is showing no signs of slowing down. As stated by Ernst & Young’s latest Islamic Banking Competitiveness Report, there are now more than 65 Islamic banks, also known as participation banks, worldwide, while the number of conventional banks with Sharia-compliant departments also swells. As a wave of new competitors floods the Islamic finance market, long-established Sharia-compliant banks are undergoing a process of revisiting their long-term strategies in a bid to stay ahead. Essentially, this means keeping up with the digital revolution that has dominated the conventional banking scene for some time now. According to the report, boards of the 40 biggest players in Islamic finance are investing between $15m and $50m in new digital initiatives over the coming three years. This digital drive is particularly crucial in the GCC region, which boasts a sizeable young population. In this demographic, smartphone usage has reached a staggering 98 percent, yet 46 percent of consumers still find mobile banking difficult to access. With the Islamic digital banking services falling short of customer expectations last year, Sharia-compliant banks are now enhancing their consumer engagement with considerable success. As consumers demand flexible, on the go banking as standard, Islamic banks are responding to the realisation that being Sharia-compliant is no longer enough. Indeed, EY data shows a direct correlation between the customer’s digital experience and the bank’s revenue, and also reveals that 81 percent of Islamic bank customers are ready to switch banks for a “better digital experience”. Given that inaction in this area could cost institutions up to 50 percent of their retail banking profits, there is a convincing incentive to push forward with digitalisation. Though sukuks, also known as Islamic bonds, are still recovering from a recent slowdown, Islamic banks continue to push forward, exploring new possibilities and opportunities for sustainable grown. One such area is socially responsible investments: green sukuks. Making particularly noteworthy progress in this field is Malaysia and the UAE, which have been the most active of key Islamic markets. In fact, it was the Malaysian solar energy heavyweight Tadau Energy that sold the world’s very first green sukuk in July 2017. The MYR250m Sustainable Responsible Investment (SRI) sukuk, which is called green SRI sukuk Tadau, has been given a long-term rating of ‘AA3’ by RAM Rating Services Berhad. With this precedent set, more are soon to follow, opening up a plethora of new – and sustainable – opportunities for the world’s ever-growing Islamic finance sector. Due to the rapid economic growth of several Muslim-majority countries, Islamic finance has grown rapidly over the past decade. Oil-rich states that had accrued enormous revenues from their oil and gas industries are now shifting their economic strategies, which results in greater focus on Sharia-compliant banking. This transition has seen numerous Islamic banks successfully improve financial inclusion in many Muslim-majority nations where a large portion of the population were previously unbanked. Offering essential financial support to both individuals and SMEs, Islamic banks have come to dominate the financial landscape in many Muslim-majority countries. Although the Islamic finance industry remains just a small segment of the global financial system, Sharia-compliant banks are rapidly gaining popularity outside the market of practising Muslims. Much like traditional banks, Islamic banks offer a wide range of financial products and services, from mortgages and loans to equity funds and bonds. However, the principles of Islamic banking are sometimes more attractive to consumers than those of conventional banking. Islamic finance appeals to a broad range of consumers due to its reputation as being less prone to crisis. In a global climate of political and economic instability, Islamic finance offers a stable approach to banking. Islamic banks must refrain from engaging in activities that involve uncertainty or speculation. As such, Islamic finance is entirely asset-based, and is therefore fully collateralised. This also encourages better risk management by banks and consumers, making both parties mutually responsible. These risk management strategies served Islamic banks well in the post-financial crisis years. In 2010, an IMF report showed Islamic banking institutions had fared better than their conventional counterparts both during and after the global financial crisis of 2008. In June 2014, in response to an increased demand for Sharia-compliant financial products, the UK became the first non-Muslim country in the world to issue a sukuk. Since then, Hong Kong, Luxembourg and South Africa have all followed suit, while the US now boasts 25 exclusively Islamic banks. As we head into 2018 and beyond, the demand for Islamic finance only looks set to grow. 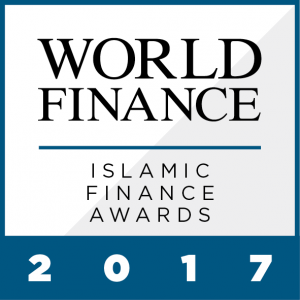 The World Finance Islamic Finance Awards 2017 celebrates the most forward-thinking players in this rapidly expanding market.